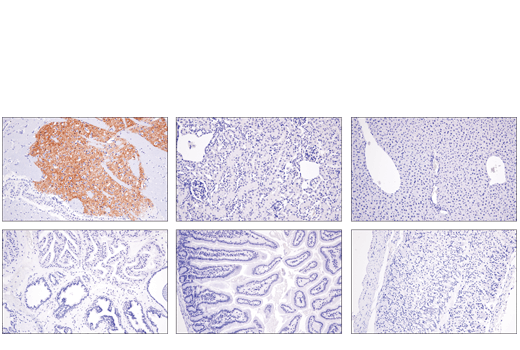 Immunohistochemical analysis of paraffin-embedded mouse striatum (top-left, positive) and other mouse tissues (negative): kidney (top-center), liver (top-right), prostate (bottom-left), small intestine (bottom-center), and stomach (bottom-right), using Adora2a/Adenosine Receptor A2a (E5I8X) XP® Rabbit mAb (Rodent Specific). 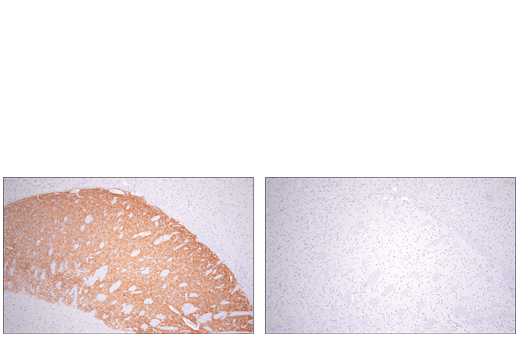 Immunohistochemical analysis of paraffin-embedded mouse striatum using Adora2a/Adenosine Receptor A2a (E5I8X) XP® Rabbit mAb (Rodent Specific) (left) compared to concentration matched Rabbit (DA1E) mAb IgG XP® Isotype Control #3900 (right). 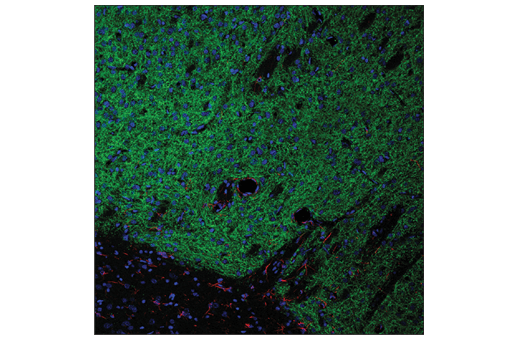 Confocal immunofluorescent analysis of rat striatum using Adora2a/Adenosine Receptor A2a (E5I8X) Rabbit mAb (Rodent Specific) (green) and GFAP (GA5) Mouse mAb (Alexa Fluor® 647 Conjugate) #3657 (red). Blue = DAPI #4083 (fluorescent DNA dye). Adora2a/Adenosine Receptor A2a (E5I8X) XP® Rabbit mAb (Rodent Specific) recognizes endogenous levels of total rodent A2AR protein. This antibody does not cross-react with human A2AR protein. Monoclonal antibody is produced by immunizing animals with a synthetic peptide corresponding to residues surrounding Ala401 of mouse A2AR protein. Adenosine Receptor A2a (A2AR) is a G-protein-coupled receptor (GPCR). As a member of the purinergic adenosine receptors (A1, A2, and A3), A2AR activates classic G-protein signaling pathways upon binding of adenosine (1). Adenosine is present in all cells and extracellular fluids. Adenosine signaling, via A2AR, is mobilized during both physiological and pathological conditions. For example, adenosine, via A2AR, modulates neuronal function, acting to fine-tune neuronal function (2). A2AR function is modulated, in part, by its ability to form functional heteromers with other GPCRs, including dopamine receptors (D1 and D3), metabotropic glutamate receptors (mGluR5), and others (3). In the brain, A2AR is enriched in the basal ganglia, suggesting that A2AR may be a potential drug target for neurodegenerative diseases like Parkinson’s disease, drug addiction, and psychiatric disorders (4). Outside of the brain, A2AR may act as an immune checkpoint molecule to maintain an immunosuppressive tumor microenvironment, an environment that exhibits relatively elevated adenosine levels (5, 6). Le, F. et al. (1996) Biochem Biophys Res Commun 223, 461-7. Sulli, G. et al. (2018) Trends Pharmacol Sci 39, 812-27. Verzijl, D. and Ijzerman, A.P. (2011) Purinergic Signal 7, 171-92. Bogenpohl, J.W. et al. (2012) J Comp Neurol 520, 570-89. Menzel, S. et al. (2018) Front Pharmacol 9, 266. Leone, R.D. et al. (2015) Comput Struct Biotechnol J 13, 265-72.